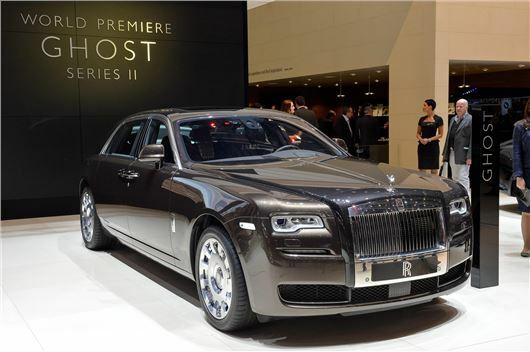 The Rolls Royce Ghost Series II made its world debut at the Geneva Motor Show and although it looks near unchanged, there are many differences under the skin. The main improvements are in handling and comfort - with the looks remaining largely the same. The styling revisions are subtle to the point of invisibility, with the reprofiled headlights incorporating new LED Daytime Running Lights being the biggest giveaway of the Series II model. But look more closely and you'll see that there also are new bumpers, giving the Ghost a slightly lower stance. New seats with a wider range of adjustments and increased heating options, are the biggest change - the driver should be gripped more tightly when making full use of the unchanged 570PS V12 under the bonnet. Accordingly, those all-important rear seats have also been improved, offering more comfort, support and new business and relaxation settings. The instruments, dashboard finishes and improved wood veneers are also offered plus there's a new touchpad controlled infotainment system with a larger 10.25-inch screen. The addition of onboard wi-fi is a Rolls-Royce first and just like the latest Mercedes-Benz S-Class, the Rolls-Royce Ghost II can now modify its gear selection depending on GPS data of the road ahead. Expect the Rolls-Royce Silver Ghost Series II to go on sale early this summer, prices have yet to be announced.